I discovered the secret to the perfect pancakes: BUTTERMILK! I know, I’m super slow sometimes. People have been making buttermilk pancakes forever and I’m just now jumping on that train. In my defense, I have a favorite pancake recipe…and I almost never have buttermilk in my refrigerator. That? Is changing as of right now. 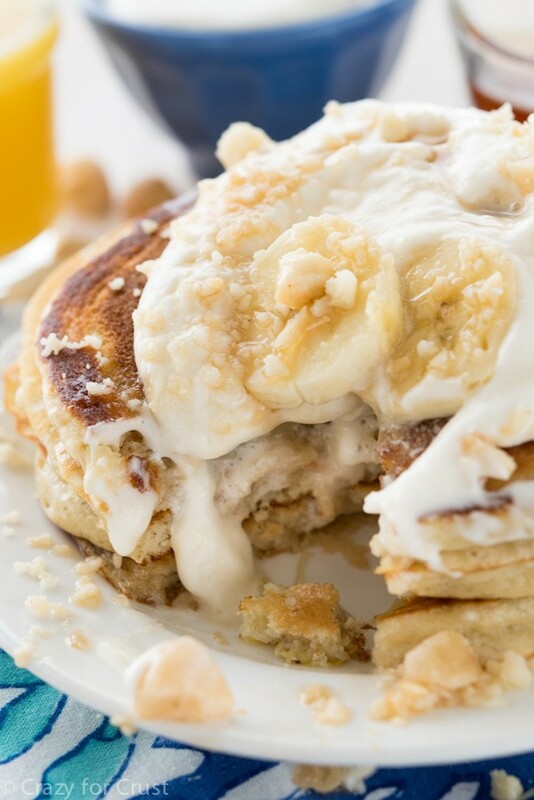 From now on I will be making Buttermilk Banana Pancakes using this recipe and I will forever have buttermilk in my refrigerator. If you read my Marshmallow Whipped Cream post last week, you may have been waiting anxiously for this recipe. These pancakes are a quasi-copycat of the ones I had at The Gazebo a few weeks back in Maui. The fuss about this restaurant is totally legit. It’s even worth the wait – 45 minutes before they even opened. We got there at 6:45am (the restaurant opens at 7:30) and there was already a line. We managed to squeak in for the first seating (there are only 14 tables). 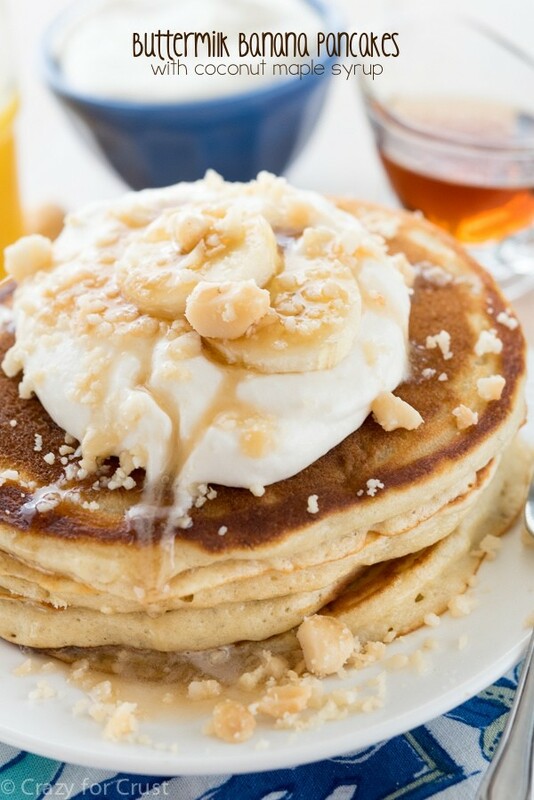 Now, you’re probably thinking to yourself: but these are banana pancakes, not macadamia nut. And that’s true, for two reasons. One, I don’t think the pancakes had macadamia nuts inside them, just on top. I may have missed them with all the whipped cream and syrup, but it didn’t matter. Macadamia nuts are astronomically expensive – even in Hawaii – so the crushed nuts on top are more of a serving suggestion. But I more than made up for that here. I recreated those fluffy buttermilk pancakes and I added banana. AND? Jordan liked these. She tasted them and said, “Wow, mom. These are actually good!” which sounded really mean but was a total compliment. What makes these pancakes so fluffy? Well, a few things. There is a full tablespoon of baking powder in them, which already makes for a fluffy pancake. But then I added the buttermilk, so I also added some baking soda. Baking soda and buttermilk are very good together – they work magic. The combination of the leavening and the acid makes for some seriously fluffy, tender pancakes! And then you add the banana. I love mashing up banana and stirring it into pancake batter. In fact, I’ve been doing that for years. It’s my favorite way to “sneak” some banana into pancakes for people who hate banana pancakes. (What never made sense was that you can totally taste the banana, but she’d still eat them and then say she hated banana pancakes. ??!!) Adding the mashed banana means you can add less milk (or buttermilk, in this case) and less oil. These pancakes have only 2 tablespoons of oil! So I got the idea for the coconut maple syrup from these pancakes. I doctored some pure maple syrup by heating it in the microwave until it boiled, then adding some coconut extract. Of course, I topped these with marshmallow whipped cream too, for authenticity. And chopped macadamia nuts (you can use your favorite nut) AND the syrup. These are totally low calorie. Buttermilk makes pancakes super fluffy and perfect! 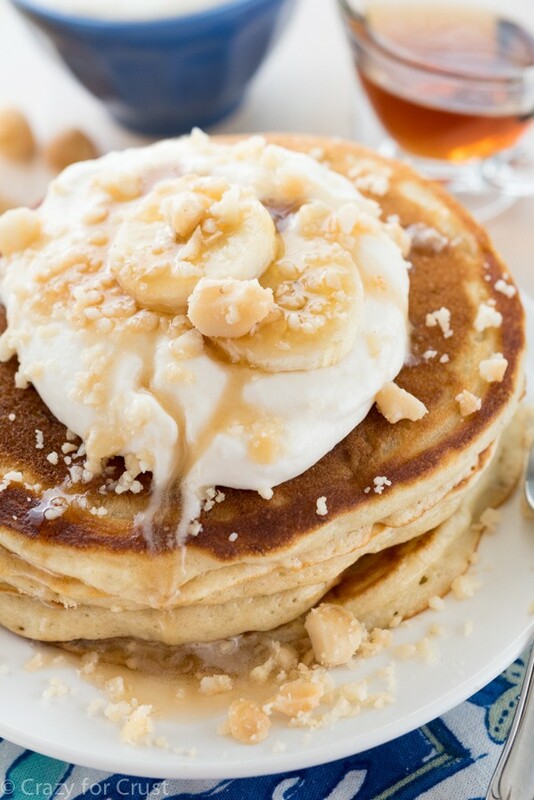 These Buttermilk Banana Pancakes add some extra flavor with mashed and sliced banana and they're all topped off with coconut maple syrup. Preheat your electric griddle to 350°F. If you’re making these in a pan on the stove, preheat the pan once the batter is ready. Whisk flour, sugar, baking powder, baking soda, and salt in a large mixing bowl. In a large measuring cup, whisk the buttermilk, oil, eggs, mashed banana, and vanilla extract. Whisk wet ingredients into dry just until mixed. Some lumps will remain. Ladle pancakes onto preheated griddle after spraying with nonstick cooking spray. I made my pancakes with about 1/4 cupfuls of batter but you can make them however big or small you want. The batter is somewhat thick, so pour the batter then spread it slightly with your ladle or spatula to spread it out. If you want to add chunks of banana to your pancakes, now is the time to do so. 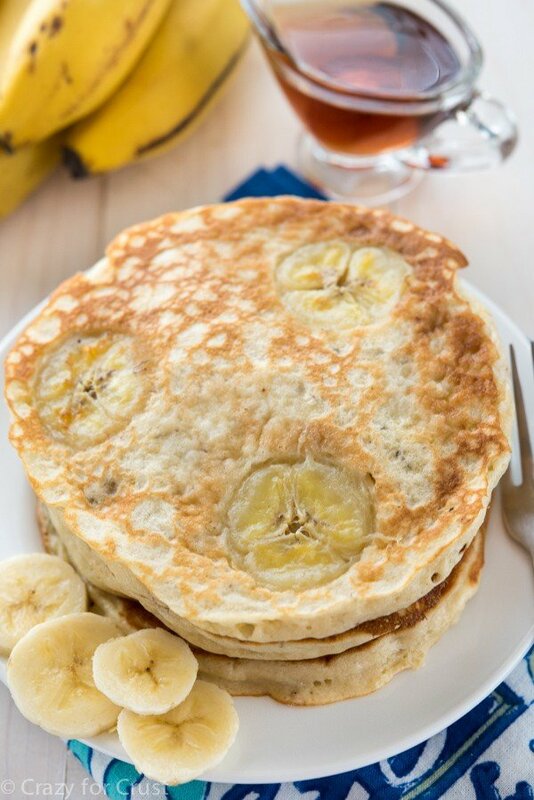 Place 3-4 thin slices of banana on the tops of each pancake. Cook until they’re brown on the bottom then flip and continue cooking until done. To make the coconut maple syrup: heat the syrup in a microwave safe measuring cup or bowl until it just boils (45-75 seconds depending on your microwave). Stir in coconut extract. Serve pancakes topped with whipped cream, a sprinkling of nuts or toasted coconut, and syrup. 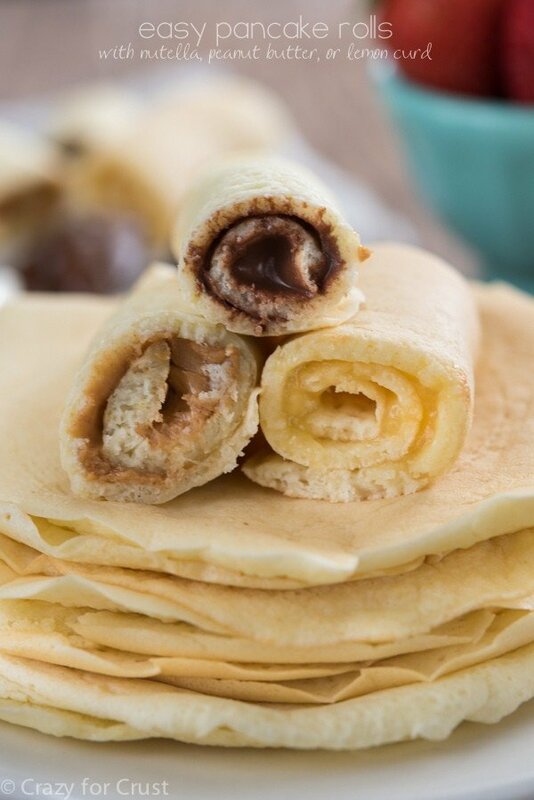 To store: place cooled pancakes between layers of paper towel and store in refrigerator for up to 3 days or freeze for up to 1 month. Oddly enough, I love banana and I like pancakes, but I’ve never had banana pancakes. Must remedy that STAT! These look so divine! Growing up, my family always made pancakes on Saturdays! I’ve never had banana pancakes though so I’ll have to add these to my rotation 😉 Love the coconut maple syrup too! Those silly banana pancake haters!! More for us! OMG!! these sound & look so good tasting!! Pinned! There is something magical about buttermilk pancakes! The kids devour them as fast as I can make them. These look so crazy awesome with that coconut syrup and topping! Holy cow, I’m drooling over here. And let me say get the powdered buttermilk too! It’s awesome stuff!!! I actually found a recipe that rivals the traditional buttermilk pancake, and it’s made with Greek yogurt! That is actually my go-to recipe since I don’t buy buttermilk as much. There’s something about the fluffiness of a traditional buttermilk pancake that gets me every time! 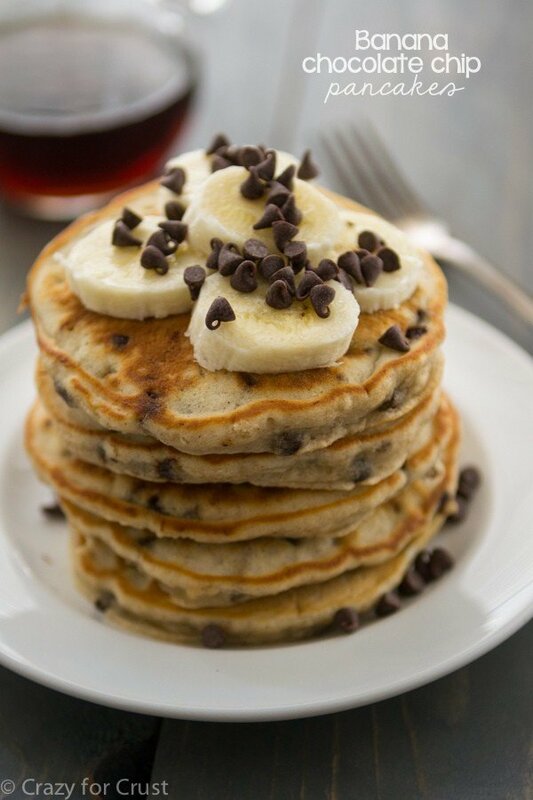 These pancakes look absolutely perfect! Seriously, I want to face plant into that glorious stack! Love buttermilk pancakes. I hardly ever have buttermilk in my fridge either and found a buttermilk powder at Walmart in the baking aisle and it’s seriously life changing! 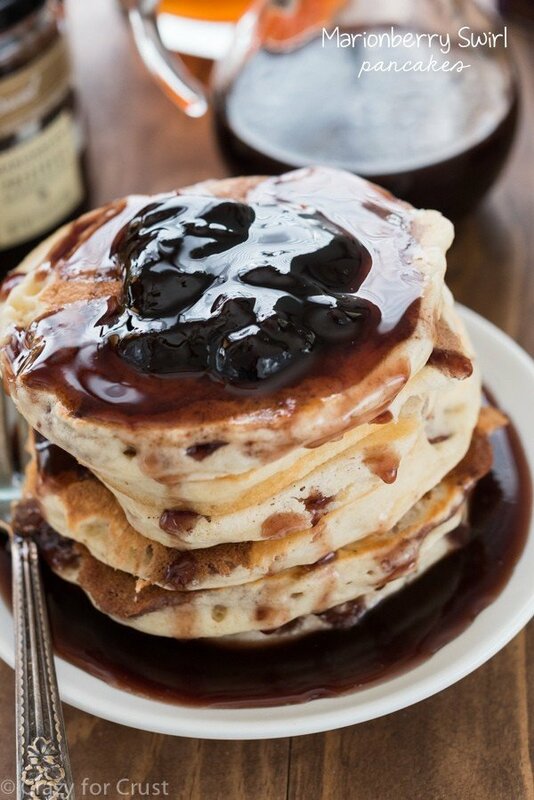 That coconut maple syrup though – boy does that sound heavenly! Coconut maple syrup sounds amazing!